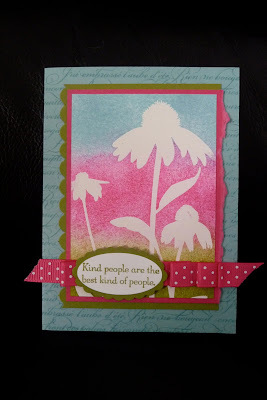 This weeks Just Add Ink challenge was to add material to your project. I was inspired to use my favorite Melon Mambo ribbon. There's nothing like opening a new roll of ribbon and I've been wanting a reason to use my Old Olive ribbon. I also decided to have a go at embossing with white embossing powder and try some spongeing techniques. I rippled my ribbon and stuck it down with tacky tape. I don't know why I hadn't tried this before! I sponged using a post it note on the right hand side to get the criss cross pattern. Oooh I love old olive. For this one I cut wavy patterns out of paper then sponged in different layers. I so enjoyed making these cards. It just goes to show how you can have different looks with the same supplies. Wow, you've been busy! I love the look of white embossing, it's so beautiful. Thanks for playing at Just Add Ink! Hey - just got the chance to look at these again. Love all the sponging techniques. Very ccol Nadine. I like how you have done a whole set too - with the colors matching but different layouts & ribbons etc. PS - Thanks for all the pressies you sent! Love from me. I love these cards, what a gorgeous effect!